All vehicles are brand new UK dealer supplied with full manufacturer’s warranty and free transported delivery in mainland UK for Honest John customers. The new Skoda Octavia Greenline model is powered by a 1.6-litre diesel engine resulting in a fuel economy of up to 88.3mpg and CO2 emissions of just 85g/km. Standard features include 16-inch alloy wheels, front and rear electric windows, eight-speaker audio system, seven-inch touch screen, Bluetooth, rear parking sensor and dual zone air con (see manufacturer’s website for the huge list of features). 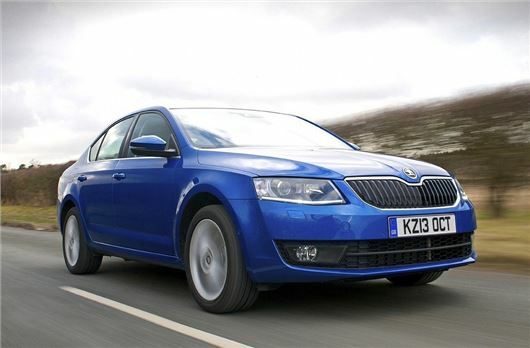 New Skoda Octavia SE models feature 16 inch alloy wheels, tinted glass, electric front and rear windows, 8 speaker Bolero CD player with DAB radio, Bluetooth and dual zone air con. New Skoda Elegance models feature 17 inch alloy wheels, tinted glass, Alcantara leather seat covering, front and rear electric windows, rear parking sensor, 8 speaker CD with DAB radio and dual zone air con with humidity sensor.